Welcome to our Fish ID Course! I’ve decided to refer to this as a course because that’s what it feels like it is to me. Not because it’s boring or tedious or you’ll have lots of homework, but because you’ll learn lots of stuff, and that will make you a more confident, capable, interesting person/diver (which is what I think learning is all about, really). Throughout these pages, you’ll meet a bunch of the ocean’s most common fish and learn how to identify them. I’ll show you some basics, let you play around with the material yourself, then give you some quizzes so you can see how you’re doing. While the heart of the course is about fish ID, you can also learn a lot more if you choose. You’ll have opportunities to study beautiful images, watch videos of fish in their natural environment, learn underwater sign language and discover interesting (and sometimes unsettling) facts about each fish as you go along. This course is designed for anyone interested in learning more about the underwater world (divers and non-divers alike). I’ve attempted to create a virtual learning environment where even the most landlocked fish lover can feel like they are seeing these creatures in their natural environment. If you are at all curious about what lives in our incredible oceans, you’re sure to find something here to tickle your fancy. I suppose the first thing I should clarify is that I’m going to start out with fish –as opposed to sea creatures. Fish generally look like this. Gotcha! That last one is actually a fish! See what I mean by generally? Secondly, as this is a beginner level course, we’re not going to learn every fish there is in every ocean. We’ll focus mainly on tropical fish, i.e. those that live in the region shown on the map below. There are many fish who live outside of this area, obviously, but 1) the tropics are incredibly biodiverse so they give us a lot to work with and 2) quite a few species outside this area are simply colder-water versions of their tropical cousins – which means this course can still help you identify them. 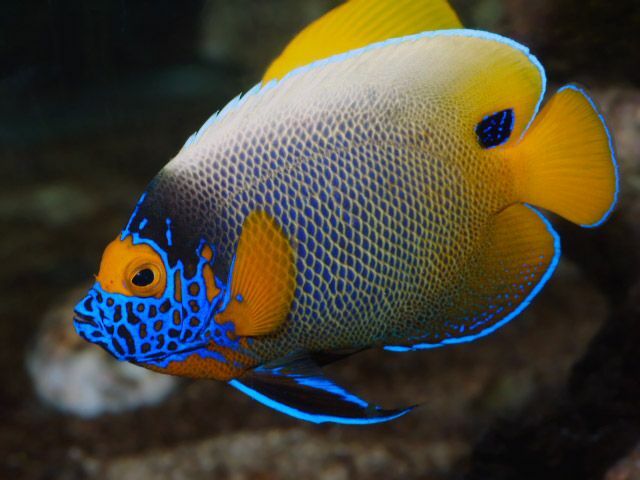 Lastly, rather than getting caught up on individual species like the queen angelfish, emperor angelfish, blue face angelfish or peppermint angelfish, we’ll focus first on the families. So – for right now at least – these are all simply angelfish. As we add higher level courses, we’ll look at these differences more (and for you star students out there I will write the full species name on photos to help you get a head start). Ok, back to Red Lips up there. If a freaky, Rocky Horror Picture Show creature like that is considered a fish, then what exactly is a fish? Let’s look at the essential elements that define our fishy friends. Fish come in every shape and size you can image. However, they all share some basic features – the most telltale being fins and gills. If you see something that doesn’t have fins and gills, it is not a fish. Gills can be tricky to see as they are usually covered by a protective plate, but fins are pretty easy to spot. Our batfish friend above doesn’t seem to have anything resembling fins in the photo, but if you watch it swim around it starts to look a lot more like a fish. Here’s a breakdown of the different fins and their names. Take some time to get familiar with the vocabulary as I’ll use these terms to describe fish throughout the course. Once you’re familiar with these basic elements, you’ll will become more aware of variations in their shape. For example, some fish have big, round snouts and some have thin, pointy ones. Some, like sharks, have distinct dorsal fins. Others’ fins are nearly invisible. By knowing the basic shapes for each feature of a fish, you can start to deconstruct them, which makes identification much easier. The surgeonfish below, for example, is the only one with a continuous dorsal fin, crescent tail fin, oval body shape, downward pointed mouth, and special feature near its tail (more about that later!). Taking note of the variations in the boxes below will help you break down individual features, making it easier to identify your mystery fish. In addition to the shape of its features, the markings on a fish can help you identify them. Common places for markings are around the eye, along the body or on the tail fin – basically anywhere on the fish, I suppose. The location of the marks and the orientation (vertical, horizontal or diagonal) can sometimes help you narrow down the family or even the specific species. 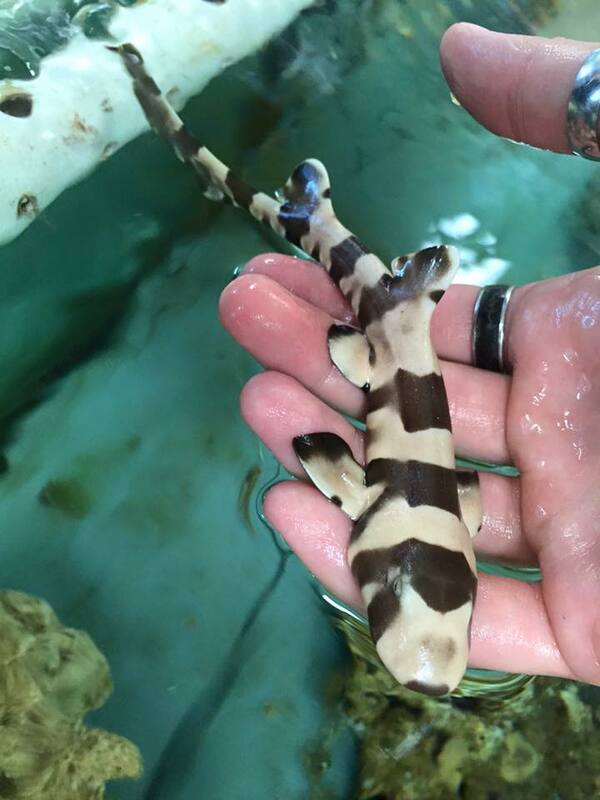 They can also tell you about where the fish is at in its developmental process, as some change their markings drastically from babies to adults. Now that you know the basics about what makes a fish a fish and how their features can vary, it’s time to dive in and meet some in person. We’ll start with a few you’re likely to see on nearly every dive. When I first started diving, I was blown away by the number of different creatures in the ocean. It was exhilarating seeing so many new animals, but also overwhelming because I had no idea how to talk about them – either underwater (a finger pointed at “that one”) or above the water (“the fish under the rock that was kind of blue but with the stripe about halfway down and the grumpy face”). Chris had been diving for a while already and I felt very behind in my ability to talk coherently about what I had seen on our dives, not to mention totally dependent on him to fill out my logbook with any type of accuracy. I started trying to teach myself (lowering my aims pretty quickly from Every Fish in Every Ocean to The Fish I Am Most Likely to See), but even at a beginner level, I struggled to find good resources that would help a newbie diver (or scubi newbi, as I will henceforth call them) gain this knowledge on her own. I relied almost exclusively on experienced divers to either tell me the name of a fish or point me in the general direction where I could start my hours-long web search. This is how everyone seems to learn this stuff; go on a dive, find something weird and ask the guide about it. While it’s great to learn from experts (and obviously really helpful), there are two things I don’t like about them being my only source of information: 1) Guides can be wrong – sometimes just a little wrong but others incredibly wrong (at least for someone like me who is a fiend for accuracy). 2) Having someone tell you the name isn’t as helpful (or, for me, as memorable) as having to figure it out based on your own logic, reason or study. Ever the dedicated, over-achieving student, I wanted to learn how they knew it was the fish they told me it was. Surely if I learned their logic I could start to figure these things out for myself and not need them to tell me, right? Right. A while back, I decided to make a little outline, initially just for myself, that would help me learn how to identify the fish I was seeing on our dives. That grew into an idea for a fully-fledged course that could help other scubi newbies (it’ll catch on, I just know it) feel more knowledgeable about the creatures they start to discover. It’s the resource I really wished existed when I started diving myself. So without further ado, may I present our Fish ID Course! The handy ocean-blue button below will take you to the Basics page, where we look at the two key elements that make a fish a fish. From there, you’ll move on to individual snapshots of the most common reef fish and how you can easily identify them while you’re diving, snorkelling, watching a nature documentary or visiting an aquarium (though their little signs are usually pretty helpful). Casual visitors can dip in and out for whatever morsels they find useful, while more dedicated academics can challenge themselves with quizzes and puzzles. I sincerely believe there’s something here for everyone, diver and non-diver alike. School of Fish – Original art by Sketched Out a brilliant illustrator with a passion for puns.